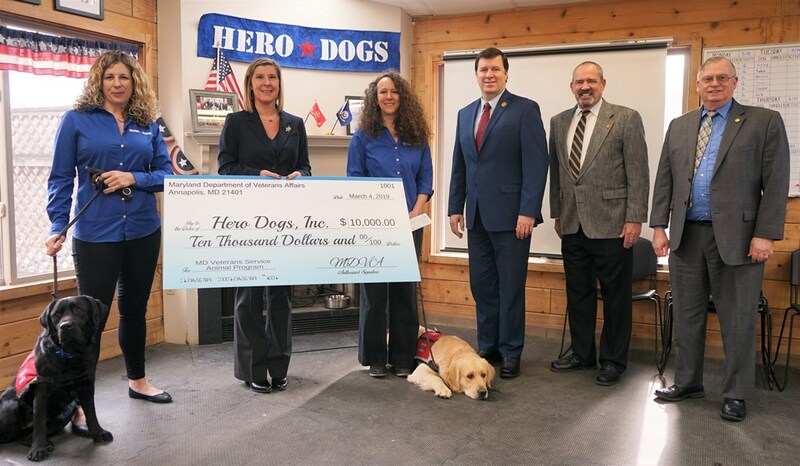 Brookeville, MD – Joined today by Maryland Senator Bryan Simonaire (District 31, Anne Arundel County) Hero Dogs Founder Jennifer Lund, and Hero Dogs Executive Director Nikki Charles, Maryland Department of Veterans Affairs Secretary George Owings awarded the first Maryland Veterans Service Animal Program Fund Grant. Joining the small gathering of staff from Hero Dogs was Robert Finn, Deputy Secretary and Dana Burl, Director of Outreach and Advocacy for Maryland’s Department of Veterans Affairs. The $10,000 grant was the first one awarded since the Program became law. During the 2017 Maryland Legislative Session, SB441 created the Maryland Veterans Service Animal Program and Fund in the Maryland Department of Veterans Affairs. Introduced by Senator Simonaire and approved by Governor Hogan on May 4, the Program took effect July 1, 2017. The Governor in 2018 also appropriated $150,000 in general funds for the Fund. 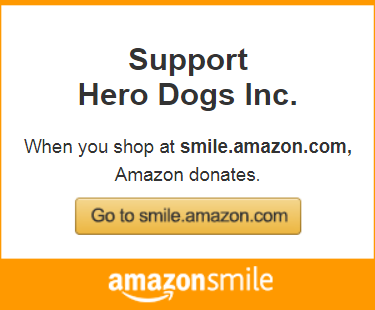 Three service animal organizations are now participating in the program: Hero Dogs, Warrior Canine Connection and Fidos for Freedom. Each of the programs may receive grants for pairing eligible veterans with service animals once they are trained and ready for placement. The Program also raises awareness of the benefits service animals provide to military veterans. To learn more about the Maryland Veterans Service Animal Program and Fund please contact Dana Burl, Outreach Director, Maryland Department of Veterans Affairs at dana.burl@maryland.gov or 410-260-3842. The Maryland Department of Veterans Affairs is a State Government Executive Department with a service mission to assist veterans, active duty service members, their families and dependents, in securing benefits earned through military service. Learn more about the Department at veterans.maryland.gov.